A successful leap into starting your own business should be planned, slow, and marked with self-awareness. 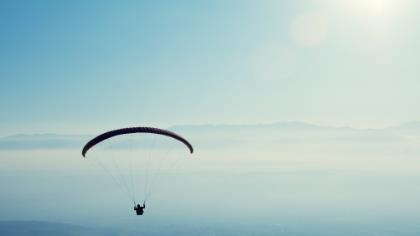 The thought of leaving my job of seven years to work from home felt rather like jumping out of a perfectly good airplane. My stomach felt relocated to my throat and my mouth felt full of cotton balls. Once I “jumped” there would be no way back and there wasn't any certainty of a safe landing. But then I made the leap. And ever since then I have wondered why I didn't do it sooner. First, a little bit of pre-jump background. I started working at a small community newspaper in high school as an intern. They liked me, so I ended up staying through college. The pay wasn't much more than I'd earn doing retail or fast food, but I wanted to write, so it looked good on my resume and the paycheck was always there. I graduated college in the middle of a recession when jobs for grads were slim, and since my husband had a good job in the area, relocating to find a new job wasn't an option. After applying to better-paying jobs for two years with no success, I decided to create my own. I'd done a few writing and photography gigs on the side, and in 2011 I gave myself a name and my business, Pixel Press & Photo, was born. Some weeks, I'm not quite sure where my paycheck is going to come from, but every week it's been there, without fail. So how do you transition from employed to self-employed, working from home? Here's what I've learned. While it felt like skydiving, I took the transition from employed to self-employed slowly. About a year after I started my business, my son was born and I didn't want to work a 60-hour week with a baby at home. We looked at our finances and decided we could afford for me to switch to part-time work. My job was never a 9-5 position though, and after a few months of working days, nights and weekends in a schedule that was never the same from week to week, I left to dedicate all my working hours to my own business. If I would have left my position in 2011 when I first started my business, I probably would've landed flat on my face. Instead, I got enough clients to build a portfolio. I started a website and a Facebook page and then I started applying for freelance work. The few gigs that I got were enough to pay for the new computer and software that I needed to do my work efficiently, so I didn't start with debt. By the time I left my job, I had one consistent client that wasn't quite enough to cover my old paycheck, but enough to give me the confidence that I could find work (and do the work well). It took me awhile to find that sweet spot—the type of work that I both enjoyed doing and did well enough to earn five star reviews. I knew I wanted to write, but there are millions of freelance writing options out there, so I narrowed it down. I used my journalism background to offer media materials and discovered a love (and a big need) for quality web content writing. I even found topics to specialize in, like photography and family. At first, I didn't know anything about running a business. So I started reading. I talked to colleagues and professors that had experience with freelancing. I looked into what was already out there and where there was a need. Without that, I wouldn't have discovered the resources I've used to find almost all of my clients. Let people know what you are doing—I've been surprised at the work I've found simply through word of mouth. One of my college professors used to tell me all the time to “put a fork in it.” Writing (like many other things) can always be improved, but there comes a time when you have to put a fork in it and call it done. I reached a point where I couldn't build my business any further in the time I had left after working my day job—that's when I knew it was time to leave. I don't mean that I was done improving (if college taught me one thing it's that I should always be continually learning). But, I was done building enough of a base to make a living. I couldn't get new clients and keep the current ones happy in the time that I had while working two jobs. I didn't have enough work to quite cover those consistent paychecks, but I knew it was now or never. Deciding to quit my job with a steady paycheck to work on my own from home was one of the hardest decisions I've had to make in my career. But, it's also been one of the best choices. I'm glad I made the jump, but I'm also glad I planned ahead and packed a parachute—getting my business going while I still had a steady income turned out to be the combination for a perfect landing.